An Entire Window Wardrobe Hangs from a Single Rod! Love window treatments with that opulent, layered look but hate the thought of drilling into woodwork or walls to hang multiple curtain rods? There?s no need with this all-in-one window wardrobe, available in two lengths! Six-piece window wardrobe includes: 2 Lustrous, Woven Damask Window Panels, 54? 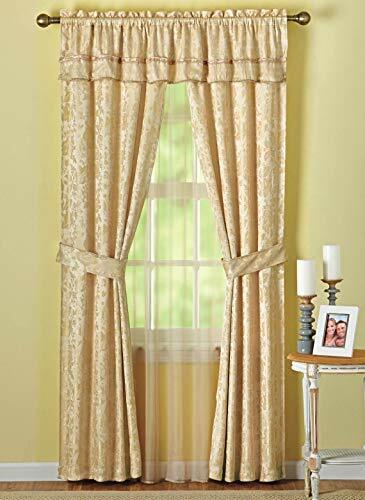 Wide; Matching Damask Valance; 2 Damask Tiebacks; Sheer PanelEasy To Hang & Easy CareThe damask panels, valance and sheer panel are all attached at the top to a single rod pocket so they hang from a single curtain rod. The matching damask tiebacks make it easy to achieve that swept-back look that decorators love. Come wash day, the entire ensemble slips off in one easy motion, then washes and dries by machine! Choose from three classic colors to complement every decor. Polyester. Come wash day, the entire ensemble slips off in one easy motion, then washes and dries by machine! Choose from three classic colors to complement every decor.